An unassuming man sporting a fedora and a National Resonator guitar took to the Kirkland Art Center stage sipping on a local brew, armed with self-deprecating humor and a notebook full of stories to tell an intimate crowd on Saturday, October 28. The Jeremy Wallace Trio (Wallace – guitar and vocals, Matt Gruenberg – bass and Tom Costagliola – drums) calls New Jersey home but their songs tell stories that can be applied anyplace. Wallace has a voice that, at times, resembles a young Bruce Springsteen and at others, Tom Waits at his surliest. His music is American roots music, blending gritty blues, country and folk. On this night, Wallace also broke out an acoustic guitar to test out some new songs on the audience. Wallace was tutored by the “Mayor of MacDougal Street,” Dave Van Ronk, as a young musician and the influence the folk legend had on him is strong. Van Ronk was influenced by Leadbelly, Scott Joplin, Jellyroll Morton and Duke Ellington and rolled all of these influences into a unique folk style that Wallace has carried with him into the 21st century. 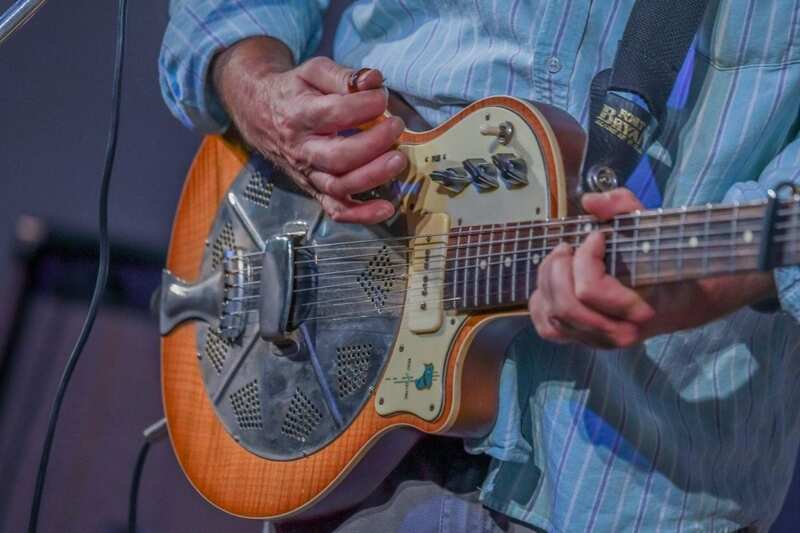 The intimate setting of the Kirkland Art Center, a converted church in the heart of Downtown Clinton, is ideal for a performer such as Wallace. The 100 or so people in attendance hung on every word spoken between songs and the sound, aside from a little buzz from Wallace’s amp that interrupted “St. James Infirmary,” was clear throughout the room. Wallace engaged in some back-and-forth between audience members, who treated him like a close family friend. The band opened with a subdued “Sporting Life Blues,” a song widely credited as a Brownie McGhee original. Van Ronk learned this one as a young man and taught it to Wallace. The song immediately drew the crowd in as Wallace and crew set the tone. The original song “Missing You This Morning” evoked a country charm, leading into the bluesy “Lickin’ My Lips,” an audience favorite and one that was referenced more than a few times throughout the night. and like that leaf, she was set on going. And while Wallace can paint a sad picture, the man isn’t above self-deprecating humor either. Following “Johnny” and rousing applause from the audience, Wallace introduced his song “House Painting in America.” He mentioned the house painting business he has at home. He’s just doing the music thing until that takes off, he said. He lamented that he would love to be able to be one of those people who works from home, but the brushes aren’t long enough. A rim shot from drummer Costagliola punctuated the story. 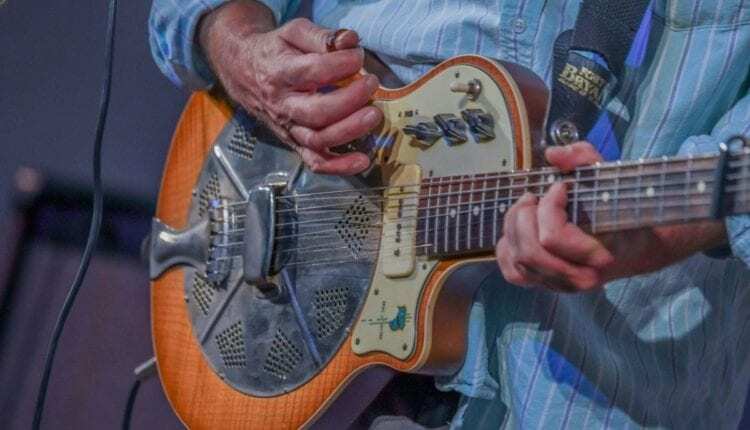 Wallace’s setlist vacillated between blues stomps and heartfelt country-style ballads over the course of the two sets. It was obvious that the trio has a fan base in Central New York and one that was eager to hear new material. Another heartbreaker followed in “Cold October.” He closed the set with a “song he wrote for a girl named Monique” called “Virginia.” This song, from his most recent album, Suicide Suitcase, is perhaps Wallace’s best-known song and one that his fans had been calling for throughout the night. Fans sang along and gave a standing ovation as the song finished. After being “coaxed” back onstage for an encore, the trio busted out the swampy blues rocker “Goin’ Down” from the album She Used to Call Me Honey. This song brought several in the audience to their feet to boogie down to the beat laid down by Constagliola and Gruenberg. Following the show, band members freely interacted with audience members to catch up on one another’s lives since the last time the trio performed in the area. Humble and gracious in the congratulations being passed around, this trio is one that takes it’s relationships with its fans seriously. The Kirkland Art Center regularly hosts acoustic musicians. Local product Darryl Rahn will perform next on Nov. 25 followed by the popular newgrass band Floodwood on Dec. 8 and 9. General admission tickets for all three shows are available through Eventbrite.